Molded plastic frames w/ painted "gems"
Weddings are all about the future. You know... you and your partner growing old together, lemonade on the porch, and all that jazz. But now that we've established that your future is so bright that you are gonna have to wear shades, it's time to throw on those shades and party. An over the top glamorous pair of shades is just what you need for a variety of bachelorette parties. Maybe you'll be floating on an inflatable unicorn. Maybe you'll be toasting to the future over a long patio brunch. Maybe you'll wear these sunglasses at night. It's your pre-nuptial celebration, you do you! 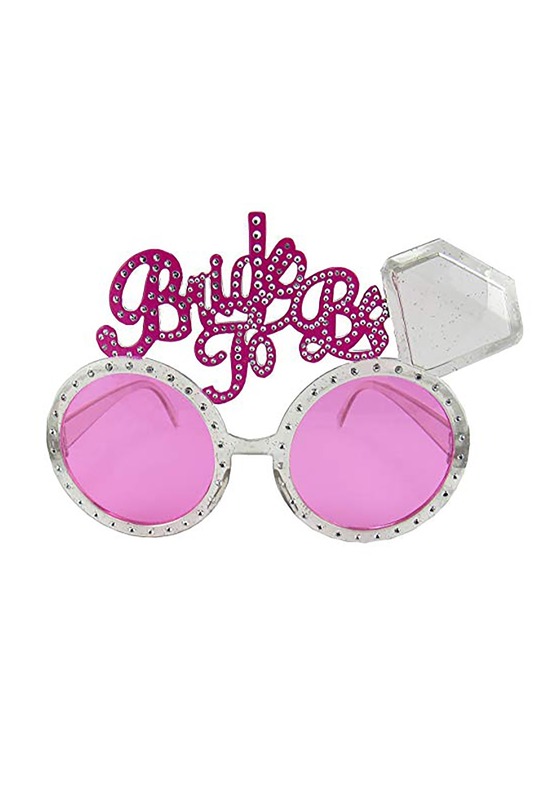 All we know is these glasses are sure to make every bride-to-be snapshot extra Instagram worthy! These rose-colored glasses have lovely clear frames with rhinestone-like dots painted around the lenses. It's topped with Bride to Be and a diamond for a fun, over the top finish that no one will miss! Having a beachside bachelorette? There's nothing like sun-drenched memories that'll bond you and your friends closer together than ever. So that even after you do down the aisle and the last piece of buttercream frosted cake has been eaten, you can still be sure this party is one they won't forget!